With a foundation date of 1899, Olympique de Marseille can boast with a rich tradition and a history of success. In addition to ten national championships, they are the current record holders for most victories in Coupe de France, having won the competition ten times. To this day, Marseille are still the only French club to win the Champions League, having done so in 1993. 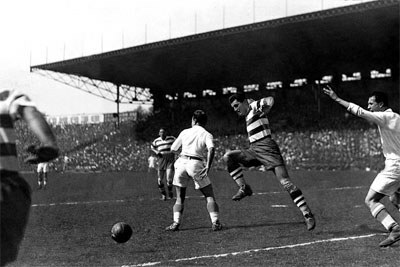 Coupe de France final with FC Sète and Olympique de Marseille in 1934. While Marseille was officially founded in 1892, it wasn't until 1899 that the footballing section was introduced to the club. The first taste of silverware for the football club came in the 20s, with three Coupe de France trophies in 1924, 1926 and 1927 being a harbinger of their first French championship in 1929. The introduction of professionalism in French football in 1923 paved way for further success, most notably two Ligue 1 titles and three Coupe de France trophies between 1935 and 1948. During this period, the team had settled at their new home at Stade Vélodrome, with a 35,000 capacity at the opening. The club's first era of dominance arrived towards the end of the 60s, during Marcel Leclerc's reign as president. The ambitious businessman had no problems with signing big-name players, and Marseille quickly established themselves as one of the best clubs in the country. They claimed two Ligue 1 titles and two Coupe de France trophies before the temperamental Leclerc resigned in 1972 following a disagreement with the club's board. The resignation of Leclerc turned out to be the beginning of an era of decline, which saw Marseille end up with a single trophy (the 1976 Coupe de France) in the next 17 years. In 1986, the club's fortunes changed for the better when Bernard Tapie was appointed president. By assembling a team of superstars such as Jean-Pierre Papin, Didier Deschamps and Eric Cantona, Tapie made his intentions known – make Marseille the first team in French football to win the Champions League. In 1993, this dream became a reality with a victory over Milan in the Champions League final. In the meantime, Marseille dominated the domestic competitions, winning four consecutive Ligue 1 titles and one Coupe de France between 1989 and 1992. Following a match-fixing scandal in 1994, Marseille was stripped of its Ligue 1 title and got relegated to the Ligue 2. This eventually led to Tapie leaving Marseille, which resulted in the club entering another period of decline before returning to the top division in 1996. After an 18-year post, the club won another Ligue 1 title in 2010. The logo of the club has shifted several times through history. In most versions the “M” letter has been a dominant part. The text below the letter, “Droit au but”, has also been a part of many versions of the logo, which translates in English to “Right into the Goal”. 1892 The club is established. 1899 Football is introduced to the club. 1908 Winning its first local tournament (Coastal Championship). 1924 Winning its first national tournament (Coupe de France). 1937 First time Ligue 1 champions. 1937 Moving to Stade Vélodrome. 1993 Winning Champions League for the first time. 1994 The club is relegated to Ligue 2 for the first time due to a match-fixing incident. 1999 First UEFA Cup victory. 2010 Winning its first Coupe de la Ligue. 2018 First Europa League victory. 2011-12 Quarter-finals Eliminated by Bayern M.